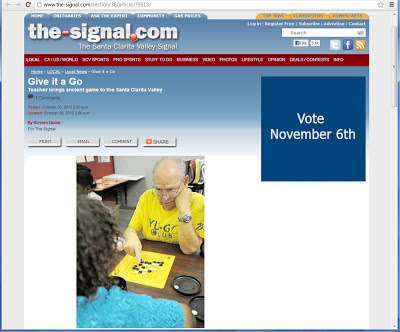 Active member and founder of the Yu Go Club, Joe Walters, is presented in the article "Give it a Go" published by the "Santa Clarita Valley Signal." Joe Walters is presented as the "Teacher of the Year in 2012 by the American Go Foundation, a charity that promotes Go to children and schools. The award secured him a free trip to North Carolina for the biggest Go tournament in the U.S. of the year." A great article where you can find out a story of how Joe Walters started a club to teach kids how to play Go.